Though that’s all we know right now, and hopefully more will be confirmed in the coming weeks, that’s what T-Mobile told Engadget. Galaxy Note is almost a year old device, and we all know that Samsung will be launching the Samsung Galaxy Note II soon, so all I got to say is that launching it now is not the best move, but if T-Mobile is planning to launch it with a low price tag e.g. below $100 then I think it would be a fair deal. Anyway, tell us what do you think. 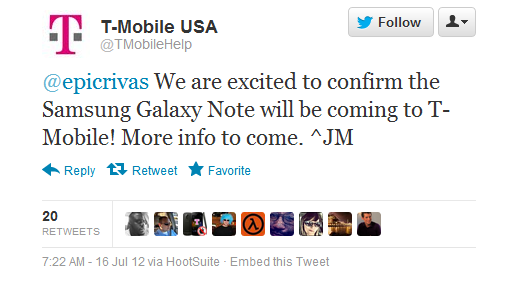 Would you like to wait for the Galaxy Note II or you are planning to grab T-Mo Note? Tell us about it in the comment box below.